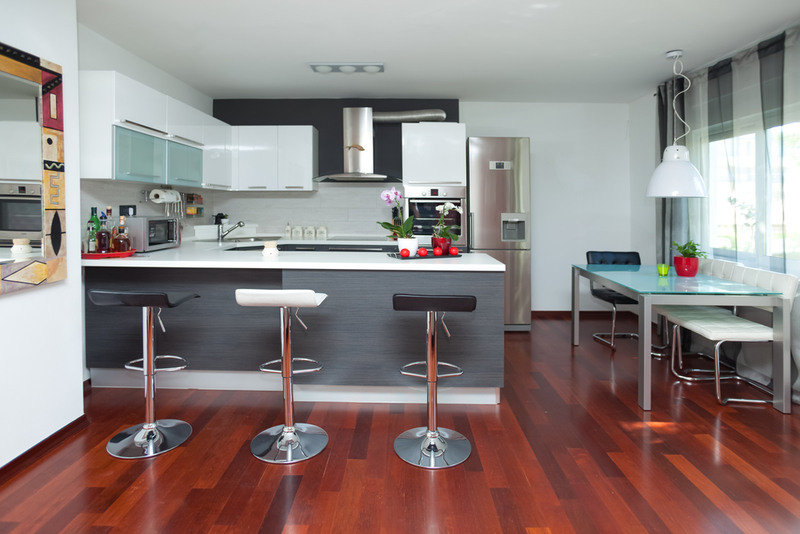 Are you looking at redesigning your kitchen? If you are then you probably want something that really makes a statement, right? You don’t just want the same old thing you’ve always had. That means putting in a little bit of work to find just what you’re looking for. And of course, a bit to get one of those designer kitchens started. Designer kitchens aren’t just more expensive versions of what you have. 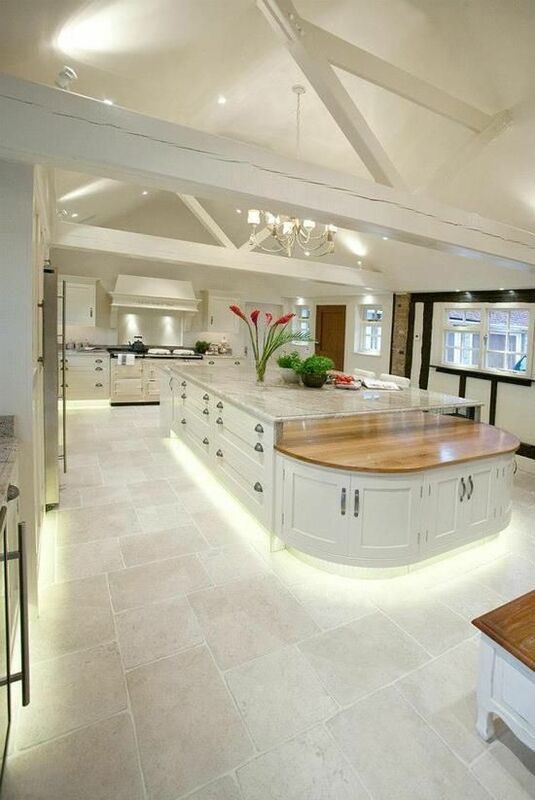 These types of kitchens should have some of the best of the best. They should have excellent quality countertops and cabinets. They should also have high-quality flooring, lighting and everything else you could think of. You expect something ‘designer’ to be the best available. If you’re looking at designer kitchens for inspiration for your own you should get what you pay for, right? Unfortunately, these types of kitchens are going to cost more money and that means looking at your options. If you can afford to spend anything and everything, go for it. You can get top quality everything. If you can’t, however, look at where you can cut back. The cost of designer kitchens can vary greatly because it depends on what you’re looking for. If you want something that’s high class all the way you could easily pay upwards of tens of thousands of dollars. If you want to get a few designer aspects you would still be looking at several thousands of dollars at least, and up to $10,000. It’s all going to depend on you. Custom cabinets alone can cost over $500 per square foot. Marble or granite countertops can be over $100 per square foot. And you’re not even getting into the flooring or lightening with those numbers or the installation costs. If you want to hire someone to design things for you, it’s even another cost altogether. That’s why it’s important to get an idea of what you want before you get started. Think about how much money you have to budget towards the plan and work from there. Think about the most important aspects first. Do you really want custom cabinets but aren’t as concerned about the countertop? Maybe you absolutely have to have granite countertops but aren’t as concerned about the cabinets themselves. It’s up to you what needs the money and where to cut a little extra. We’ve gone through and found a number of ideas for designer kitchens. That way, you’ll be able to take your pick and get something that really looks great. All you have to do is see what you like best. Whether you’re looking to go all out or improve just a few things, it’s easy enough to get it done. We’ll even help you with where you want to start your improvements and just how they’re going to help you in the best way possible. It’s all about choosing the right pieces to improve the style of your kitchen. 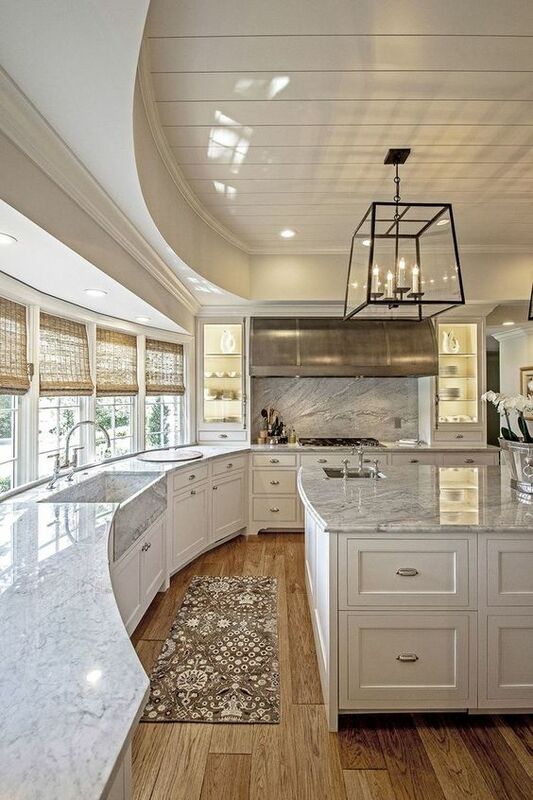 Luxury is definitely present here with the white marble countertops and large farmhouse sink (also marble). 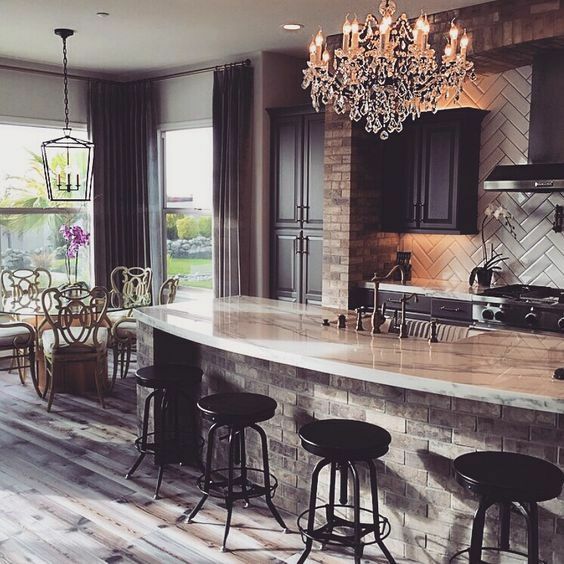 You can also see the wide spaces, large island and marble backsplash over the large stove. 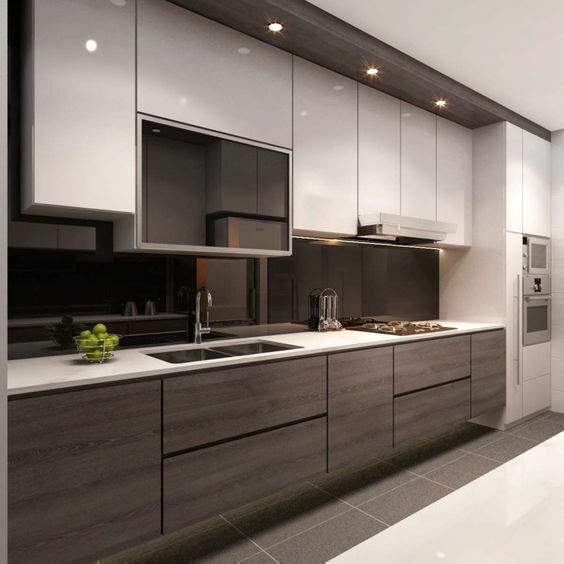 This kitchen doesn’t look all that special, but the modern style of the cabinets is definitely something. Plus the backsplash is so clear that it actually reflects the cupboards. 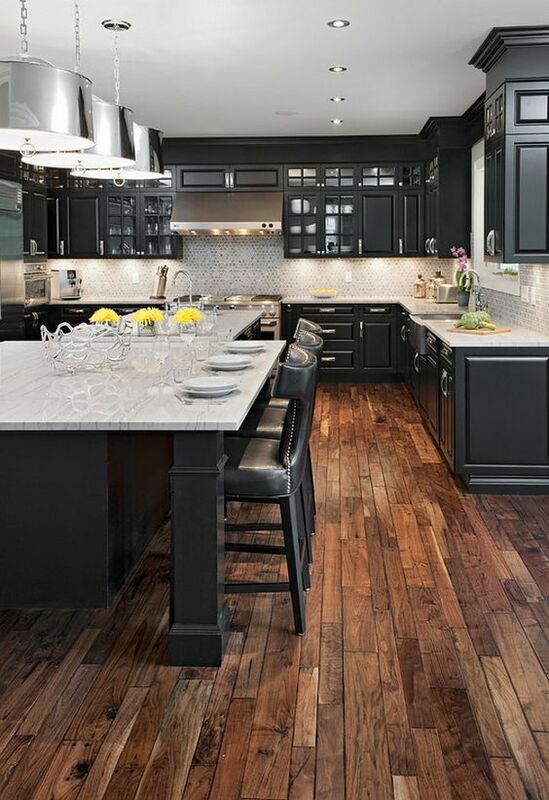 The somewhat antique color of the back cabinets with the dark wood to compliment is elegant enough. 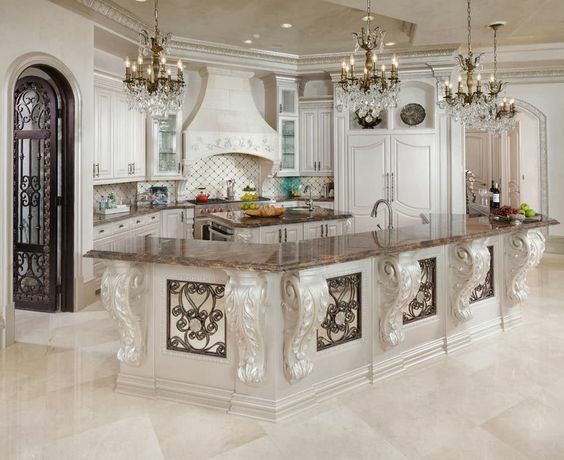 Add the marble style floors and countertops, the chandeliers and the huge island and you’ve got a super luxury winner. 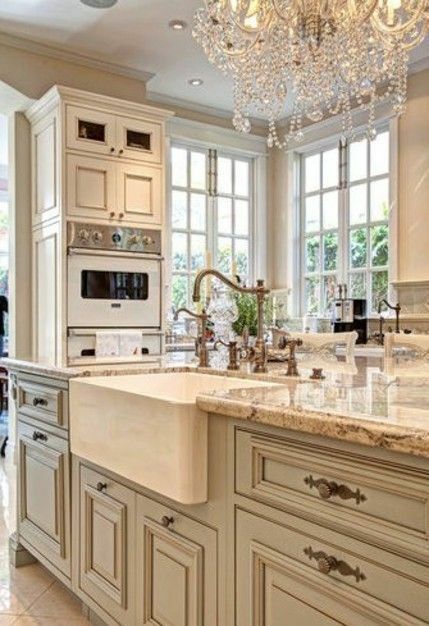 This giant kitchen has plenty of cupboard space, a large chandelier, elegant styling and a whole lot more. With the marble floors and giant stove you’ve got something super high end here. 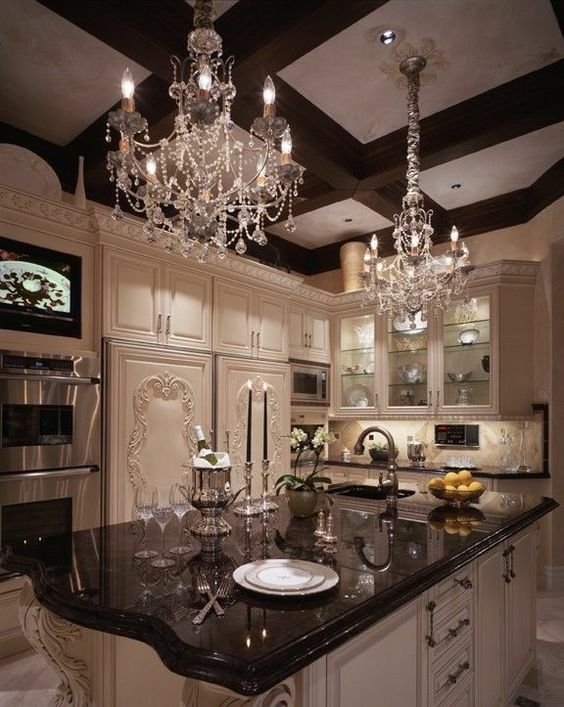 This kitchen is a little on the lower end, but still luxury, with a beautiful chandelier and large, marble-topped island. Add in the brickwork and it really looks unique. 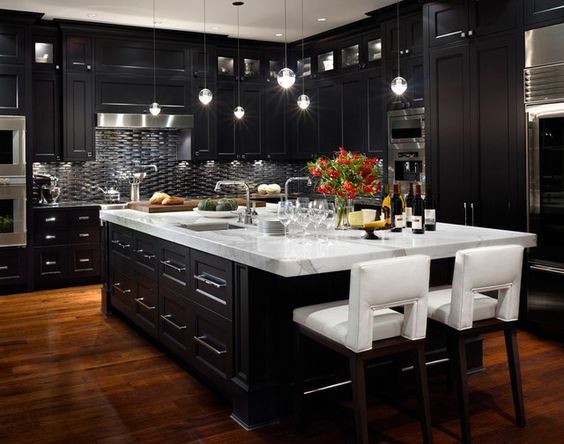 The black cabinets in this kitchen really seem bold and elegant with the teardrop style lighting. With the thick marble slab on the island and the deep wood floors (plus the large appliances) you get a really elegant and luxury feel. White on white can be elegant on its own but add the white cabinets and white marble style floors here and you’re over the top. 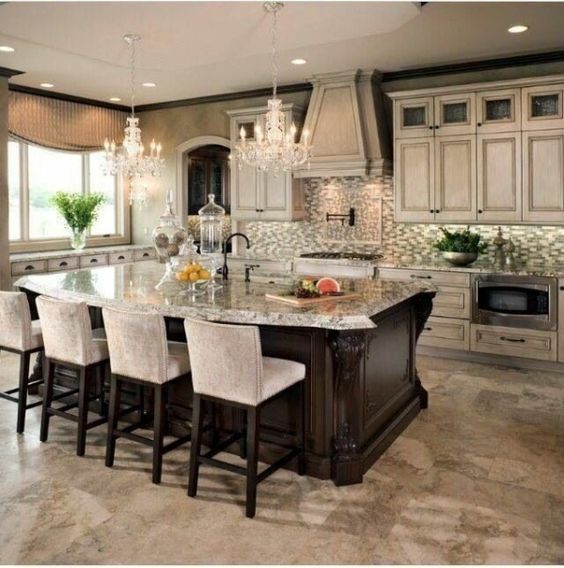 With the bronze colored countertops and plenty of chandeliers, not to mention the elegant gateway, you’ve got one of the best designer kitchens here. This kitchen tones things down a bit with the rustic style wood floors and basic cabinets. But the marble countertop and silver lights help to class things up a little more. Deep wood in the cabinets and the two large islands as well as the ceiling give this room a designer look. 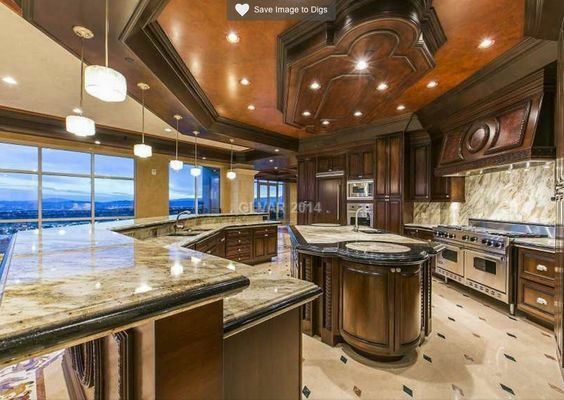 Add the marble of the countertops and you’ve got yourself a winner in the luxury department. 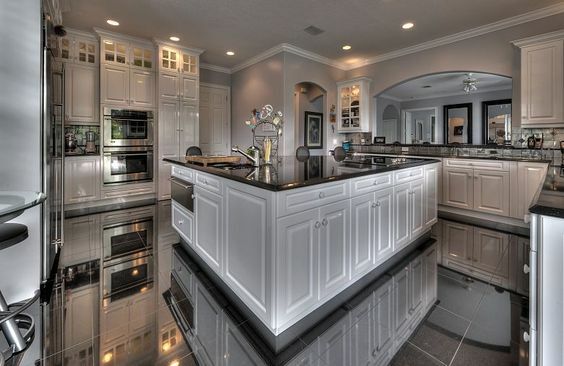 The appliances in this one seem to shimmer on their own, nevermind the shimmer of the cabinets. 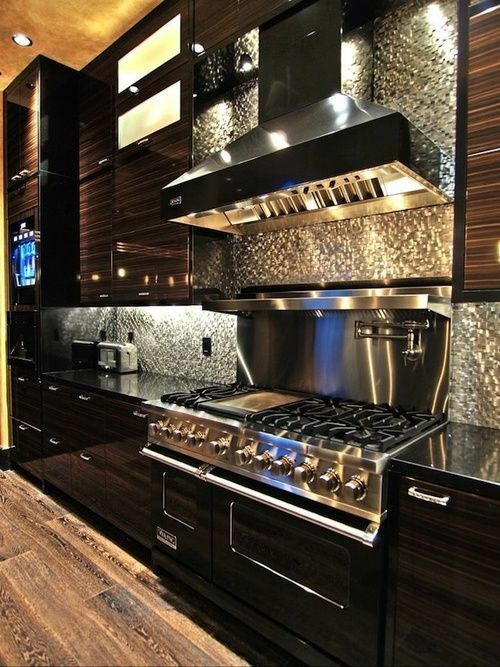 Plus the silver backsplash only serves to make things even richer looking. A large kitchen always looks ritzy and this one has large appliances, an oversized island, and underlighting to enhance that opinion. Even more, the floors are so shimmery that they actually reflect the entire kitchen back to you. This style of the ceiling with the chandeliers screams plenty of money. The accents on the cabinets to give it an antique but fashionable look only enhance that opinion. 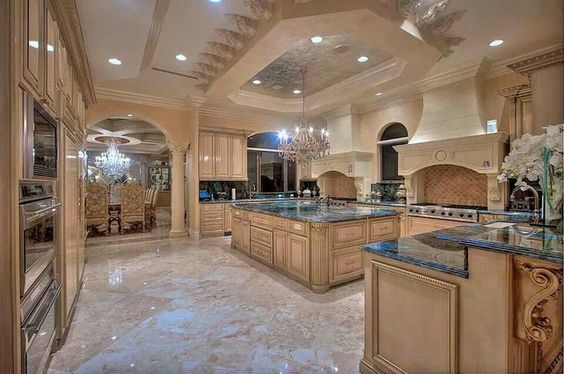 This kitchen is vast and has some elegant tiles and marble countertops to go along with it. The underlighting is a nice touch, but other than that it’s got basic cabinets so it’s beauty on a budget. Ivory cabinets give an antique touch that the veining in this marble countertop helps to enhance. The chandelier and bronze fixtures create an antique but classy feel as well.